These Las Vegas ghost tours will take you to the most exciting abandoned and ghost towns in Nevada, California, and Arizona! If you enjoy haunted places and are fascinated by everything paranormal and the UFO, you will get a kick out of these paranormal tours departing from Vegas. Explore Area 51, Goodsprings, Techatticup Gold Mine, the town of Chloride, or hunt ghosts right in Vegas. If you are brave and prepared to get locked down in a haunted saloon, this is the Las Vegas ghost tour you have been waiting for! The infamous one hundred year old spooky Pioneer Saloon is the venue. Ghost hunting equipment is provided, unless you have your own, wow! 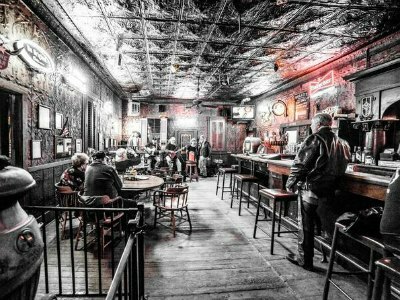 According to legend, the Saloon is haunted by a number of ghosts who may or may not grace you with their presence. Be prepared to encounter Ruby's Ghost, the Old Miner's Spirit or the Crying Girl. This is not for the faint hearted. A knowledgeable specialist in the paranormal is waiting for you! This is a must tour for the UFO enthusiast who wants an up-close personal view of one of the Nation’s most secretive areas of research. Traveling by SUV your first stop is McCarran International Airport where you will watch the unmarked Janet Airline planes fly workers to and from Area 51. From here your ten hour tour takes you through Indian Country where you will be amazed at the petroglyphs that are shaped like aliens and in awe of a dry lake bed that has had numerous UFO sightings. 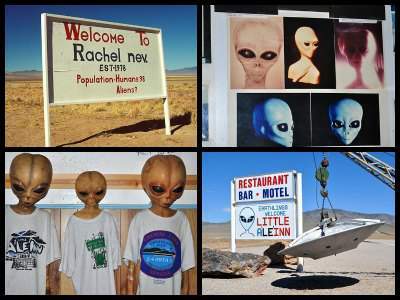 Traveling down the Extraterrestrial Highway, you will have plenty of opportunities for photos at Little A’le’; the famous restaurant in many documentaries about Area 51 and the movie Independence Day, is also a mini museum of Area 51. After a delightful lunch of “Alien Burgers” you will be taken to the black mailbox at the entrance of Area 51. Here you will observe the perimeter of this highly secured military facility. You will finish your alien adventure with a return trip to Las Vegas through Joshua Tree forest. This tour takes place at Eldorado Canyon, not far from Las Vegas. 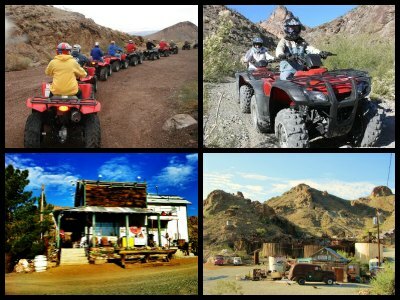 This is a combo of a fun-filled ATV ride and a walking tour of the abandoned Techatticup gold mine, now believed to be haunted. Located at the Lake Mojave, Eldorado Canyon is a picturesque little oasis in the middle of the desert. However, it's mostly famous for the Techatticup Mine, that is now a historic site one of the most attractive places to go in Las Vegas. The mine is part of the dark past of Nevada - it took away many lives during the Great Gold Rush in the 1800s. While you won't exactly hunt ghosts during this day trip from Las Vegas, you will venture around the Gold Mine and learn about it's scary history. The ghost hunter in you will love this adventure that takes you to Las Vegas ghost tours in the early evening. Your Las Vegas ghost hunt adventure begins and ends with hotel service and a quick 25 mile ride in a comfortable coach to the old-time bustling silver town of Goodspring, Nevada, which has been seen on the Travel channel’s television show Ghost Adventures. Once you arrive at Goodsprings you will enjoy a fabulous pizza dinner at the restored Pioneer Saloon, which is a treasure drove of mining artifacts and memorabilia from the Old West. After pizza you will embark on a guided-tour of the ghost town that will include a narrative history of the area. Try-out your ghost-hunting equipment in the various abandoned buildings you venture through. The walk through the town grave yard is not for the light hearted. Patrons must be 18 years of age or older and there are clothing restrictions. This adventure will take you from the Hoover Dam to Lake Mead to ghost towns all the while traveling down the famed Route 66. Your journey starts and ends with hotel service that will take you first to the Hoover Dam for photographs of Lake Mead and the enormous Colorado River. From there your nine hour Las Vegas ghost hunt tour will take you to the small mining town of Chloride. The town has about 250 people and has survived since the first silver mines opened in the 1860s. The residents are walking encyclopedias on mining and there are several antique shops to browse before enjoying a nice lunch. Next you will travel on the iconic Route 66 highway to a small ghost town named Oatman, Arizona with a whopping population of 150. 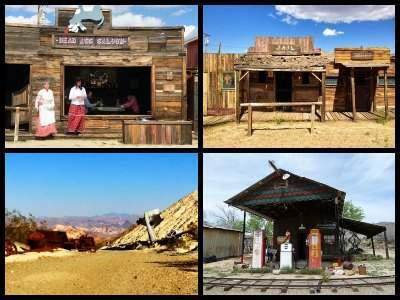 Here you can take photos with a famed Route 66 in the background or witness a live reenactment of an Old West gunfight. The final stop on your exciting Arizona ghost town tour is at El Dorado which was instrumental as the backdrop for many movies and the million dollar of Techatticup Mine. Minimum age requirement is 7 years and there is a maximum of 13 people per tour. 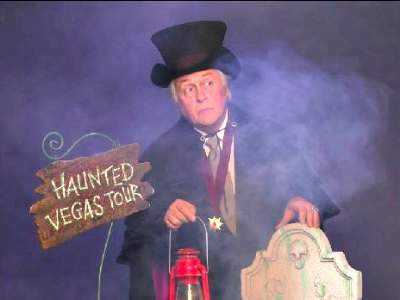 Do you think you could enjoy scary Las Vegas ghost tours? This Haunted Tour will take you to the eeriest places in the city - sites where murders and disappearances have occurred, and sites that are believed to be haunted. There are around 21 places in the city where paranormal activity was registered. Some famous apparitions that haunt Vegas from time to time include Elvis Presley, Bugsy Siegel, Redd Foxx, Liberace.